If you've ever looked at a builder's guide for a desktop system on any major tech site (including this one), you've undoubtedly noticed that the first thing to get cut to make room in the budget is the enclosure. It's not hard to see why; as long as a case keeps things cool enough and runs quietly enough, for the most part it's doing its job. It's only when you look at the greater ecosystem of cases that the real sweet spot of the market ($99-$139) becomes more apparent. What this means, though, is that the sub-$99 market is very competitive, and when you start hovering between $50 and $70, it's downright brutal. That competitive nature has forced manufacturers to get creative about fitting feature rich cases into lower price tags, and one of those cases is on hand today: the In-Win GT1. The GT1 features a hotswap bay, USB 3.0 connectivity, a semi-modular drive bay, and fan control, and comes in with an MSRP of $69. 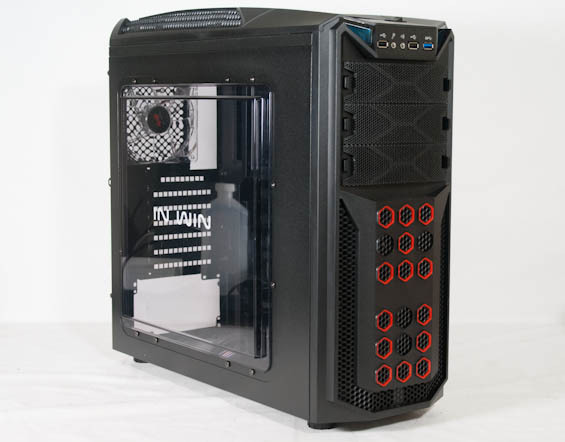 There's potential for this case, but does it offer enough to beat the incumbent in this bracket, the $10 cheaper Antec GX700? I hesitate to say "amusingly," but it's the word appropriate for how I feel about this: amusingly, the one place you almost always have to make a sacrifice in this market is aesthetics. The Antec GX700 is a stellar performer, but it's not much of a looker. The In-Win GT1 threatens to fall into the same trap and may only appeal to a specific type of user. In-Win's strapped the bulk of features in the GT1 to a case that's inspired by racing cars. Internal 6x 2.5"/3.5", 2x 2.5"
Dimensions 18.7" x 8.3" x 19.3"
In-Win seems to have saved most of their scratch by only including two fans, which isn't unusual for this price range. More disappointing is opting to use 120mm fans instead of 140mm ones; Fractal Design in particular has been putting this foot forward and really, as far as fans go, bigger is usually better. The GT1 doesn't have the room for a 140mm exhaust fan, but it really should've fit one as an intake. Unfortunately, In-Win also tags what's fast becoming one of my biggest pet peeves in case design: odd-numbered USB ports. I hate the idea that they might have omitted a second USB 3.0 port just to save a buck or two on manufacturing, and it's indicative of an old style of thinking that just doesn't fly on American shores. Designers need to realize that something like this can actually seriously hamstring a case's chances in the market; remember that Antec's GX700 features two USB 2.0 and two USB 3.0 ports. This thing was beaten with an ugly stick from the future. Awesome case, this is the one to buy. All the stupid little complaints are just that, stupid and little. If it wasn't all black I'd buy two. The unnotched spot in the drive bay is for any custom install one needs- perfect. One usb3 up front is fine, there's 2 usb2 and that's what most people have a ton of, depite the elite smarm face the techies here get when they cry and whine about every dollar, indicating usb3 items are something they have NOT AT ALL. Great case, great price, I really love the whining about it, it's just such excellent entertainment. 7. Removable mid internal tray for long video cards. Yes, I don't see really what the problem is other than the lemmings who go along with the reviewer like blind rats. If any complaint is valid, it's the lack of lots of space for cable hiding - that's it. Lets face it drives are huge today. Unless your building a NAS you do not need 7 drive bays, Frankly you do not need 6 3.5 drive bays. If you someone was going to build a really hot machine today they would probably go with two SSDs in RAID0 for the System drive and maybe two 4Gb HDDs in RAID 1 for data. I agree about only one USB 3 is a deal breaker. Drop the hot dock on top. I have some nutball stupid friends that drool because they have harddrives - and always have to show how they add them over their home lan, it's like a retarded addiction. One example, like 5.6 terabytes of HD space, with 4.2 terabytes free, and the doof wants more harddrives - people have an insane sort of addiction there - a lot of them do - and the older wackadoos think cookies and internet surfing takes up all their memory (that's harddrive space to them, memory - since it "remembers" stuff when the computer is turned off.